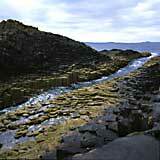 Pictures of Lunga's bird life, have a look on this site at Scottish Wildlife, featuring photos of Dirk Funhoff. 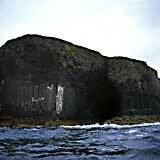 Staffa is one of Scotland's absolute marvels. 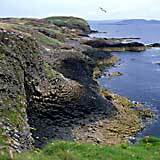 Like much of Mull, it is a product of vulcanism. 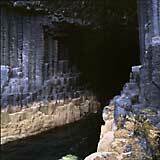 As the vulcanic lava cooled it contracted and made the characteristic polygonal columns. An interesting feature are the different strata, of strictly perpendicular columns and more chaotically bended smaller columns. 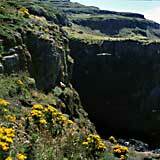 This gives the cliffs a look of a severe gentlemen with early morning hair. Approaching the isle ( there are a few small boats from Ulva Ferry and Fionnphort) the caves on the south side give the isle a kind of eerie feel - like hollow eyes. 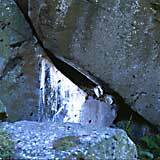 Seen from the near distance, they stress the ancient character of the site - as if they form a tunnel into prehistoric times. 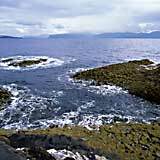 It is a small isle: about 1000 by 500 metres, the highest point being 40 metres. 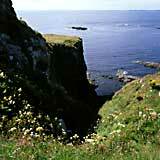 All of it is property of the National Trust for Scotland. Walking around, it feels like a much larger isle. 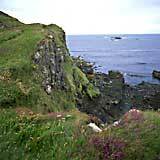 Even some metres from the edge of the cliffs, I had the idea that there was just a descending slope on the other side. So be careful! 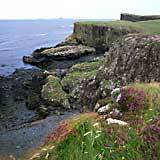 The isle not only attracts visitors, but lots of birds of well. 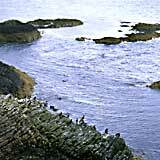 As I went to the isle at the end of July, there were not so many birds left. The young were already grown up and feeding on open sea. Nevertheless, there were still some birds left. 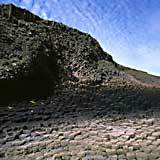 In a way the fit very well in the scenery of the isle, but form a contrast at the same time to the austere columnar basalt. 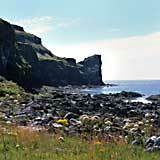 The nearby Treshnish Isles have quite a different character. 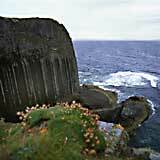 They are of about the same size as Staffa, but look more green and fertile. 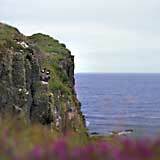 The cliffs are very impressive and there are large birds colonies. Although the season was almost gone, we managed to see some puffins. Elegant, somewhat clownesque birds, but not too showy in this time of the year. 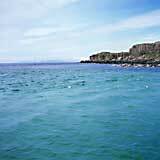 Standing on the cliffs of Lunga we could see the isles of Tiree and Coll to the west and to the north the small isles, Eigg and Rum, up to the Cuillins of Skye - 90 kilometers away! 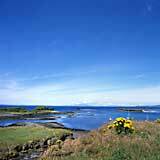 The abundant yellow flowers made a nice colour contrast to the rich blue of the sky. 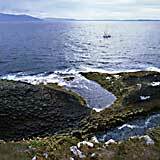 Like Staffa, the Treshnish isles have never been regularly inhabited, as they lack a constant presence of fresh water. 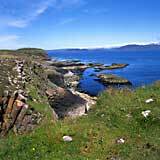 Far into the 19th century Mull communities used to graze sheep during the summer on the larger isles - common practice in the whole of Scotland, as the Summer Isles near Ullapool testify by their name.